I have long wanted to try out laser treatment on the bikini line in particular. I got the chance when Smartson was offering their test pilots to try Braun’s Silk expert. I applied and was selected. I want to make a little note though before explaining more about the technique and how I found it. I think body hair removal is a private choice. I am not disgusted by female hair on legs and arm pits more than male. They are both out natural state, ok. But I am, as many others, subject to society’s view on female hair growth and have found it hard to not remove my hair on legs, arm pits and my mustasch. So I’ve made this choice and when I’m looking for something to help me keep up with hair removal and talk about the problems associated with it, I don’t mean that hair on the body especially on a female body, in itself is a problem for me and shouldn’t be anyone elses business either. With that in mind, I have been looking for a more permanent hair removal option. All hair removal is pricey, but it seems more pricey if it’s a high one off cost. An IPL machine is certainly an investment. But not having to go to a salong for example once a month or whatever you will soon have earned that money back. Shaving has worked fine for my lower legs, this is also where my hair is dark and thick. My bikini line and going down on the inside of my legs which also where I have darker, thicker hair is a real problem area as it gets terribly infected by shaving. Waxing by myself has not worked. 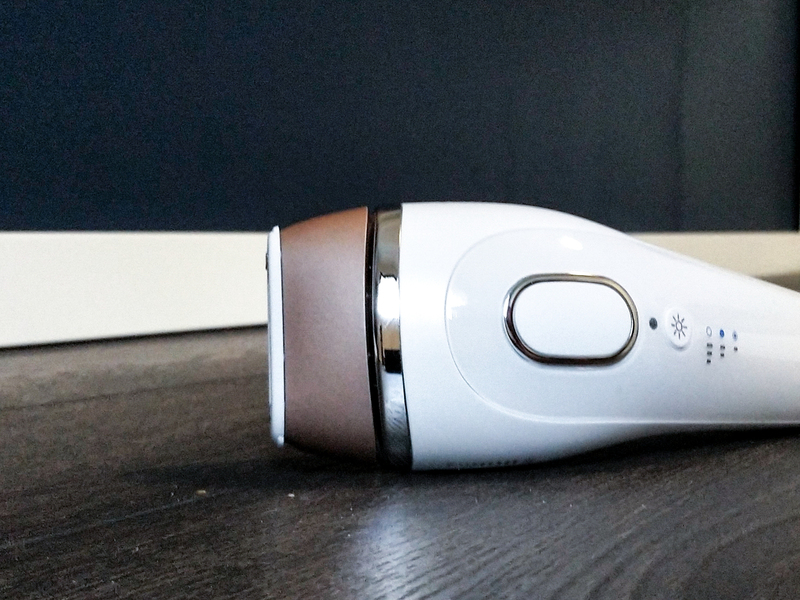 The best at-home option is the epilator, but I find it time consuming and my epilator is not working great anymore. Besides that I also have a mustasch and some dark hair on my upper lip and shin that I wax at home. That works really well. But of course is a bit time consuming with heating the wax and painful, scary as well of course. I have light skin but super dark hair in the areas where I want to use it, which should make me an ideal user for the IPL method. This is sort of the combination the technique requires as it has to have the contrast between the hair and the skin. Also using it on darker skin can be really painful apparently, so it’s quite the narrow market for this particular technique. Many light skin people have very light hair as well, so that doesn’t work very well. When the machine arrived I spent some time reading the manual and to be honest it kind of scared me a bit. But I recommend you all to read it carefully before use. Despite being the “perfect” – in this very specific scenario – candidate for IPL, I realised when reading the manual that you should be careful with moles. I have a lot of moles… So I have to avoid them. But when I started using it, I realised it wasn’t so difficult to do anyway. So the Braun silk expert you can use on your face as well. It has 3 light settings; beginner very sensitive, sensitive for face etc, and normal for legs and so on. I decided to start with my face and did my waxing routine on my very grown out mustasch. I cleaned the area with water and then went for the treatment starting out with the very sensitive setting. I am now on my 3rd treatment after that (so 2 weeks since my first) and my face is still clean, no hair beginning to grow out. You need to leave it for at least a week before doing another treatment. So the thought is that you treat each area with at least a week in between and then make the treatments further and further apart until you only have to treat it on a maintenance basis (~every quarter). I’ve also done my hair on my legs, bikini area and arm pits now (avoiding any moles). When it comes to the arm pits the hair has grown out in between treatments so haven’t seen any noticable effect as of yet. But it can take up to 4 weeks. I am finding the device very easy to use and it’s quick and pain free. As a mother of two small kids (4 and 1.5 years) the fact that it’s quick is a big bonus! I’m going to keep trying it and will get back with a final review once the test period is done. Here’s my initial thoughts and plans though. I’m happy so far!